Earlier this year the Greenwich Mural Workshop were given a lottery grant to initiate a 15-month period of research known as the Charlton Parks Reminiscence Project. 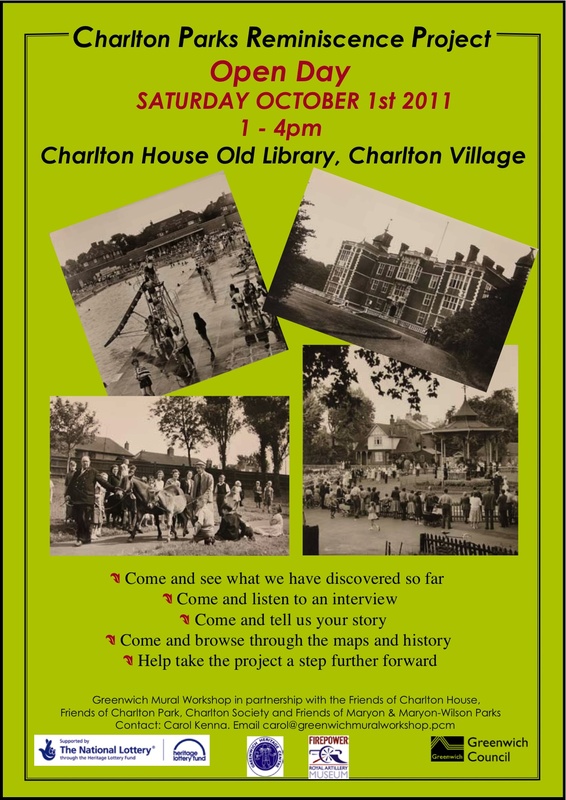 The idea for this project is to gather memorable stories from local people relating to Charlton’s various parks over the past 50-100 years (Charlton, Hornfair, Maryon, Maryon Wilson, Thames Barrier and Gilbert’s Pit). In the run up to the Olympics they will be holding three events to gather more stories but at the same time display photos, maps, interviews and information they have collected already. This Saturday, the 1st of October, sees the first of these open days as Charlton House opens its doors. The Old Library will be open between 1 and 4pm and the public are welcome for the whole afternoon or just to drop-in. You can learn more about the project or even contribute yourself if you have your own story. They are also looking for volunteers to help in their research and undertake interviews.